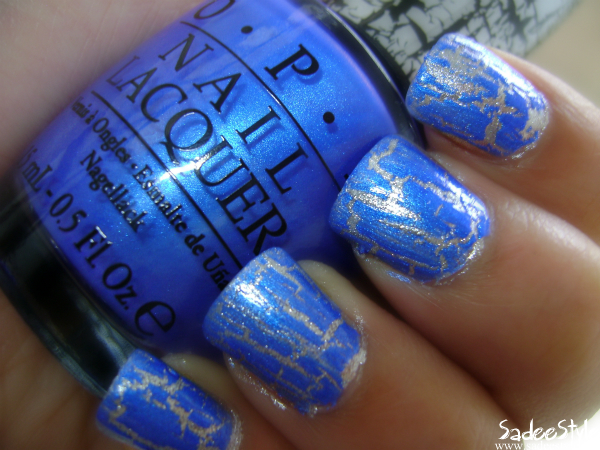 I love shatter nail polish trend they are super easy to apply and look so dramatic. Many nail polish brands featuring a special formula which when applied over nail varnish instantly shatter to give an eye catching shattered effect. We can have so many different looks with some regular nail polishes without putting so much effort and time. 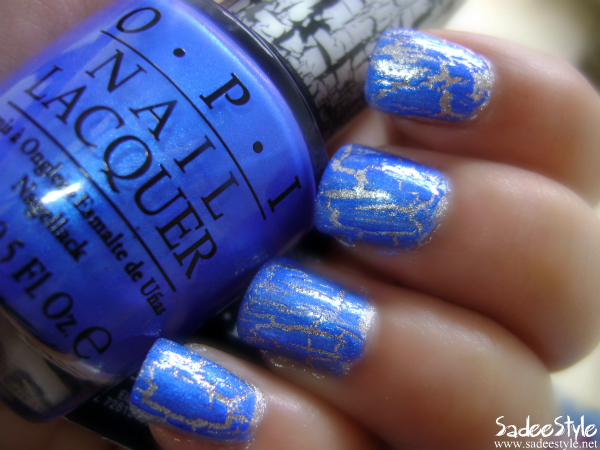 This is the first shatter nail polished that I am reviewing on my blog and it's a beautiful shimmery royal blue color by OPI and called Blue Shatter NL E56. It's a part of Katy Perry Collection also I am reviewing the RapiDry Top Coat by OPI that comes in 15ml bottle. Blue Shatter NL E56 comes in 15 ml bottle. I layered it over a silver polish and it looks extremely amazing, it also look good over white nail polish because with white a blue just pops! When I first applied it over my local brand silver nail polish it went streaky and ugly, but after a few sec it started shatter. It dried quickly with matte and dull finish, but with applying a single top coat of rapidry by opi, color just lived up and left my nails glossy and super shiny. I've seen some girls complaining that blue doesn't shatter as-well as black, but I totally disagree. It shattered beautifully as I had hoped also I am amazed to see the result of top coat. It delivers as promised and dries the polish quickly and left my nails with glossy finish. I wouldn't say it stopped chipping for me but, It really enhanced the colors of whatever color polish is beneath and gives your fingers and toes a very professional finishing shine. I now enjoy doing my own nails whereas before I'd always mess them up before they could dry. You can purchase OPI Lacquers from the retail outlets. Apply two coats of your favorite nail color. Once dried, add a thin or thick coat (depending on desired effect) of any Shatter Overcoat shade. Do not leave the bottle open, close tightly when not in use. 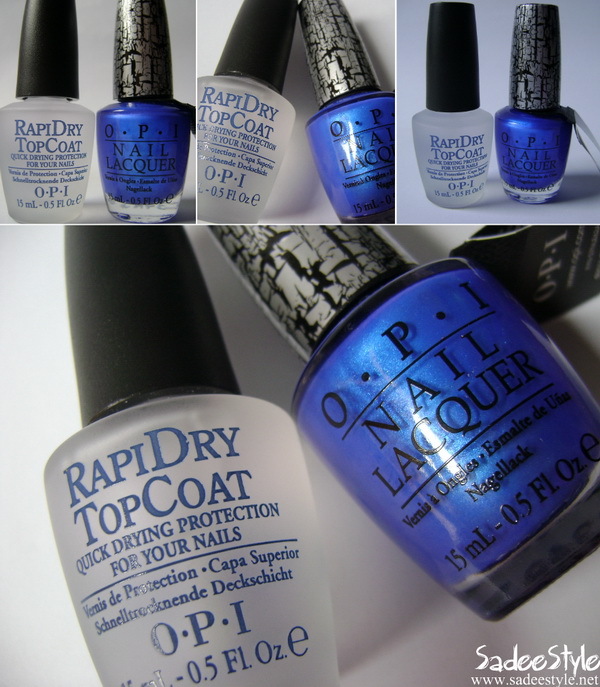 Allow it to dry and seal with any OPI Rapidry top coat. Color is trendy and vibrant. Formula is creamy and doesn't make clumps. The finish is so unique and eye-catching. Keep your polish long lasting, and allow your nails to look shiny! Texture is quite thick and gloppy. It gets thick and gummy really quickly. wow they are so cool! love them! I've been thinking about trying the crackle coat for a while now but haven't ate gotten to it. This color looks so good on you, I'm gang to pick some up!